Snorkeling Lac Bay is a treat. 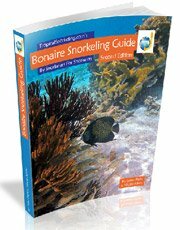 It is definitely a top Bonaire snorkeling spot, mostly because it is one of a few very shallow snorkel spots, no deeper than five feet. 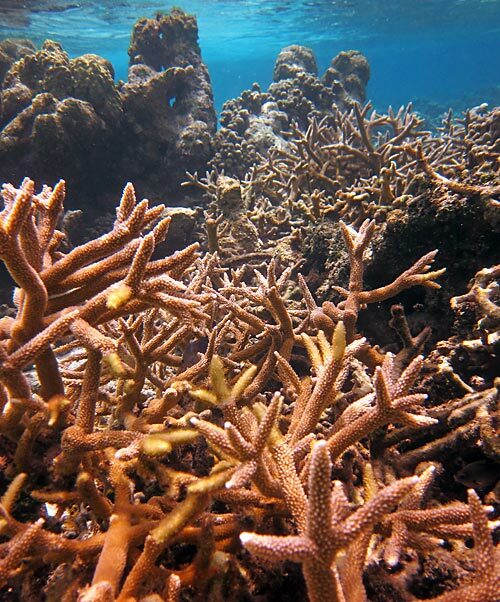 It has large patches of live healthy Elkhorn Coral, Staghorn Coral, and tons of fish. 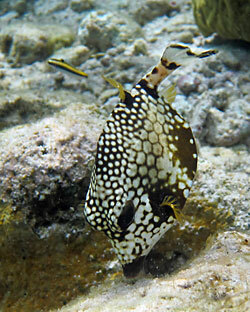 There are a few things that make accessing and snorkeling Lac Bay challenging. 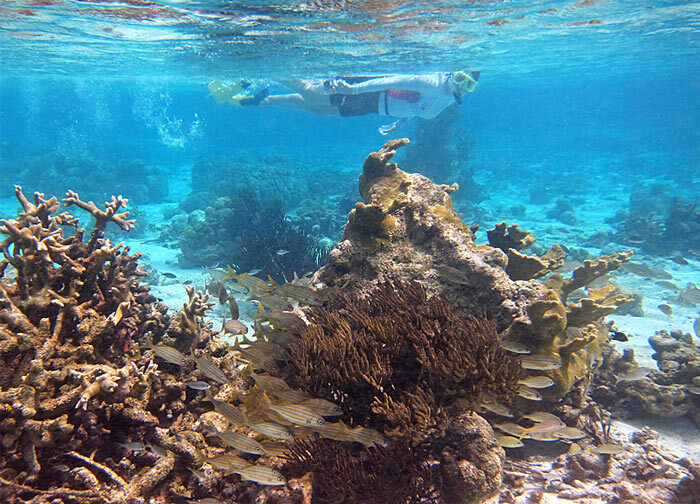 First, you have to walk in about two feet of water for about twenty minutes to reach the snorkeling area close to the barrier reef. Second, this area of the bay is also a world famous windsurfing location and you might need to alter your walking course to stay out of their way. Third, Lac Bay is on the east, rough side of the island and is exposed to the easterly trade winds. 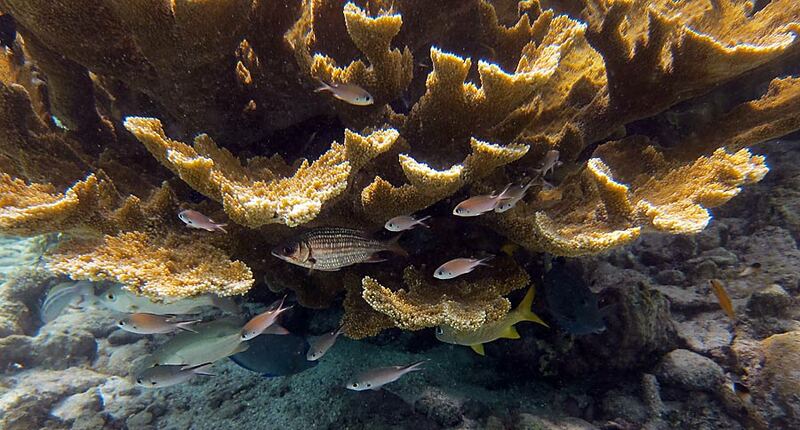 You will be snorkeling behind the protective coral reef, but when there are high winds the resulting waves push a lot of water over the reef causing a strong current that you must contend with. Snorkeling Lac Bay would be best attempted on a day with lower winds. The currents would be weaker with less waves coming over the barrier and you would likely encounter fewer windsurfers. Go to the entrance to Jibe City. Before going in, sight down the alley out into the bay. That is the direction you want to walk to get to the snorkeling at the barrier reef. 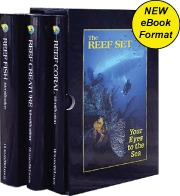 You are looking approximately in the middle of the reef as it spans the entrance to the bay. If you can see some coral heads sticking out of the water, that is where you want to head. Follow the little alley of buildings to Jibe City beach. There is a sandy path between sea grass beds that serves as your water entrance for snorkeling Sorobon Beach. For the walk out it is mostly a sandy bottom, though there are areas with some coral rubble, shells, and an occasional rock or urchin to watch out for. Avoid stepping on anything that looks dark. Wear some cheap polarized sunglasses so you can see into the water (you'll need a pocket to stash them in while you are snorkeling). 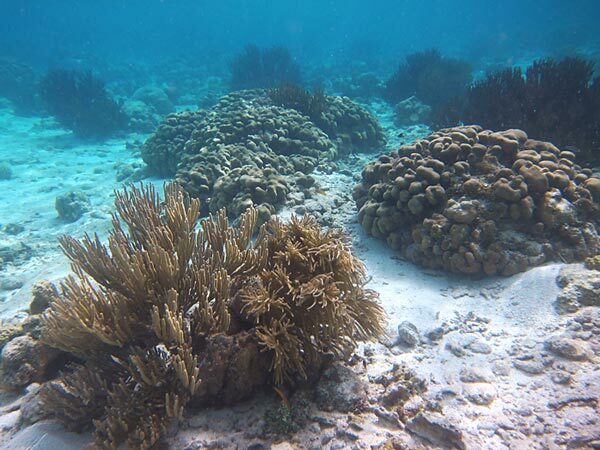 As you get closer to the reef and the water gets a little deeper, you will need to swim because there is coral rubble that you do not want to walk barefoot over. Though it is sandy much of the way, wearing booties might be best for the entire walk for peace of mind. We don't recommend wearing flip flops for this because they don't like to stay on your feet when they are being pulled through the water for this long of a walk. 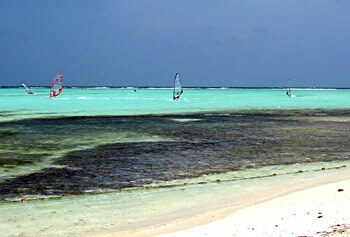 There is another path you can take if there are a lot of windsurfers during your visit. It is further south at the end of the dirt road mentioned in the driving directions. This route requires water shoes or booties because the water entrance and the bottom for a ways out is rocky. The distance you need to walk is about the same, you are just walking more parallel to the barrier reef. Polarized sunglasses would be useful here too. 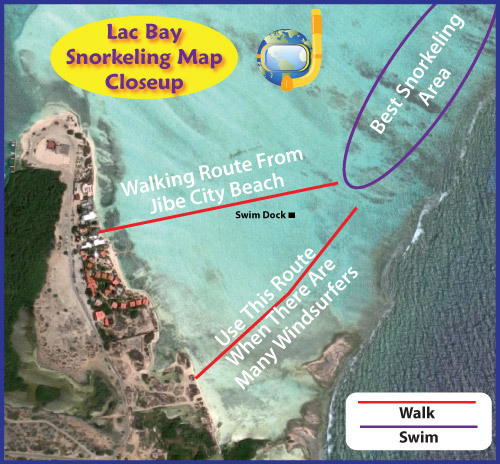 Recently someone installed a swim dock on the way out to the reef (see map). You can use it to rest on, or put on your snorkel gear. Reportedly you can see some fish that hang out underneath it too. 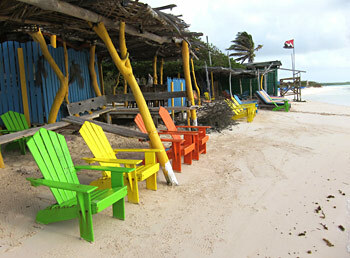 You can also rent a kayak from one of the windsurf businesses, paddle out, attach the boat to a buoy, and go snorkeling. This might be a fun way to go, and save you the long walk in and out. If you have not walked far enough to the middle of the reef and start snorkeling Lac Bay too far to the right, you can get almost up to the barrier and it is very shallow and uninteresting. 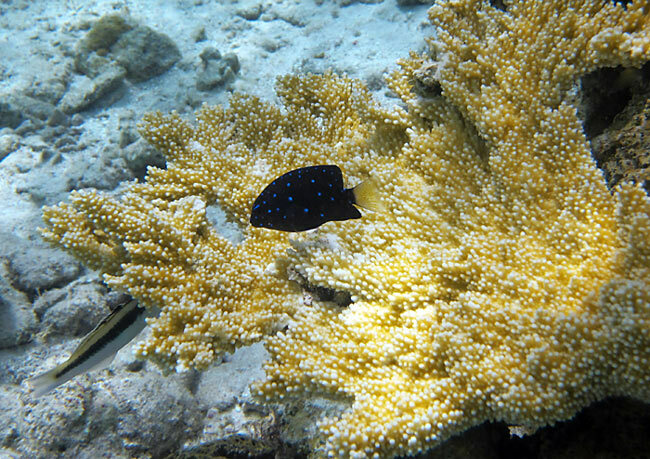 Make sure you walk far enough so you can see the healthy hard and soft corals in 4-5 feet of water. You will see many fish too. These corals form spur and groove formations that you can explore up and down. Make sure and look under the coral heads. We saw some huge pufferfish looking back at us! This is such a shallow area that you should take extra care not to touch any corals. 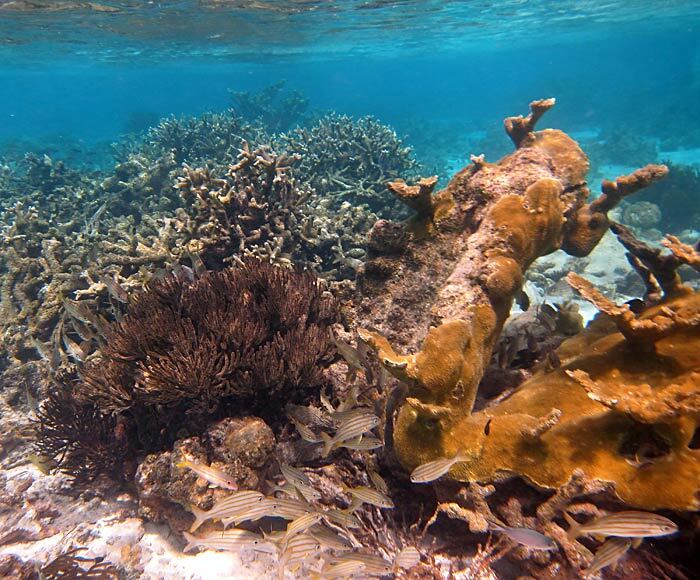 They could be quickly destroyed if tons of people visited and started banging into the corals. You will likely find that some of the grooves are deeper and have more current in them. We believe that these currents are most often toward the bay, but when the tide is going out and the wind is low, it might switch directions. 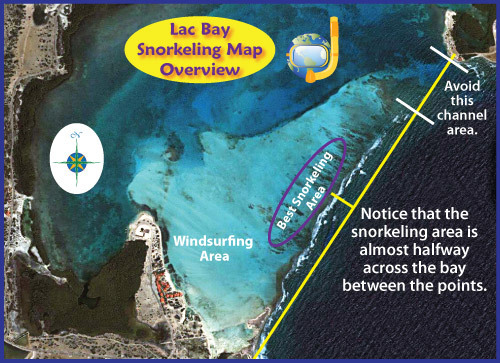 Be cautious of any possible current you encounter snorkeling Lac Bay. You don’t want to be sucked into coral or out to the ocean. Once you get to the healthy reef, you can continue to swim north and find stuff to see. Just don't swim too far north because the currents get very strong toward the ocean near the north edge of the entrance to the bay. All of the water washing over the reef into the bay exits there, so stay a good distance south of it. This was a great spot to see both fish and reef. In Kralendijk, get on Kaya Industria heading east. The first traffic circle is the intersection with Kaya International. Stay on Kaya Industria through that and continue driving by all of the grocery stores. Just past the Van den Tweel Supermarket you will come to another traffic circle. Take the first right on Kaya Nikiboko Zuid. Drive through the residential area and past the ballpark. You will pass two intersections with a well-traveled dirt roads to the left. You are now on Kaminda Sorobon. Stay on this road until it ends at the intersection with Kaya IR. Randolf Statius Van Eps. Turn left here. Take the next left into Sorobon. Drive in past the Sorobon Beach Resort and park in front of the windsurfing businesses. Walk to the entrance to Jibe City. If there are too many windsurfers, drive back toward the main road then turn left onto the dirt road past the resort and follow it to the water's edge. Find a good spot to park. 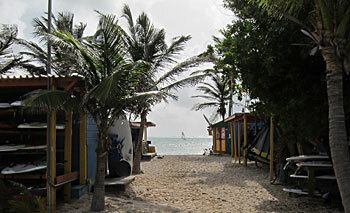 The windsurfing businesses have snack bars, surf shops with rental gear and kayaks, restrooms and showers for customers. There is a restaurant with restrooms too. If you are staying at the resort, there are full facilities available.